One of the easiest fall merchandising techniques uses different sizes of embroidery hoops or empty picture frames. Decide if you want to use yarn or 1″ strips of fabric. Choose colors in wonderful rich autumn hues like orange, yellow, plum, brown and green. Separate the hoops so that you have two and wrap the yarn or fabric around the outside of each one. Tie the fabric off and hang them from the ceiling at varying heights with fishing line. The larger the hoops, the bolder the effect. Anthropologie used embroidery hoops by adding autumn colored tissue paper between the two hoops and hanging them with fishing line. For Halloween, choose orange, black, grey and white as your colors. If you have just a little bit more time, garlands are a fun and colorful way to spread fall cheer. An autumn leaf garland can be made from felt, card stock paper, colored foam sheets or actual autumn leaves. String them together with raffia, hemp twine or fishing line depending on the final outcome you’re looking for. A Beautiful Mess, offers a free template for the leaves. The garland can be used as either a backdrop in your front window, a wall decoration or strung across your ceiling to create an autumn wonderland. 3.) What goes better with leaves? Brooms! Believe it or not, there are amazing ways to decorate your fall window with just brooms. Here are 2 ideas I found that use ordinary brooms to add some fun to your fall merchandising. The brooms with sunglasses could also wear scarves, boots and even hats. Add fishing line to the ends of the scarves and hang it from the ceiling to make them look like they’re blowing in a breeze. If you own a furniture store, create a broom family and place them in a tableau of chairs and tables. The word “eek” could easily be changed to “FALL” with the addition of another broom and some autumn colored washi tape on the handles. Add colorful silk leaves, pine cones and burlap ribbon to complete the look. Hobby Lobby is the perfect place for the large letters. Finally, something as simple as hanging a grouping of brooms as a window back drop brings out the fall spirit. Try putting a broom in the hand of your mannequin and scatter those leaves to show off fall sweaters and jeans too. I love paper lanterns! There are very few things in my opinion that make a party more festive than Japanese lanterns. 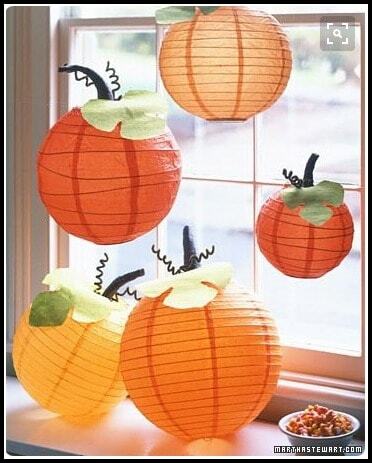 Here is a great idea for turning lanterns into pumpkins. By cutting out large construction paper leaves, using twisted black construction paper for the stems and black pipe cleaners for the vines, you can create delightful fall pumpkins. Hang them at all different levels and angles using fishing line. The beauty of paper lanterns? They are currently on sale on Walmart’s website. Get started now! Even though it may still be 90 degrees outside, now’s the time to begin planning your fall merchandising. If you need to do a little diy handiwork, you really need to get started. Get your sales staff in the mood for the coming season with new name tags made out of silk leaves or pumpkins. Add a wonderful fall scent to your shop. Whatever you do, create a delightful atmosphere with fun and colorful fall merchandising.